Web accessibility made easy: busting the myths – Let's design a better future, together. Over the last couple of years I have made a conscious effort to make my design practice an inclusive one. Core to this has been growing my understanding of accessible web design and helping other people, and businesses, be more inclusive across their digital products and services. As I’ve applied accessible design to large public sector projects (like the SA Water website rebuild and online fault reporting service) I’ve found there remains a lot of confusion about what accessible design looks like, why we should bother and where to start. In fact, web accessibility seems to suffer from a general perception problem and getting people to take it seriously is still hard to do. I believe we need to take it more seriously. Ensuring our digital products and services are welcoming for everyone is something we should all be striving for whether we work in the public sector or not. To do that though we need to unpick some of the misconceptions people have about it. 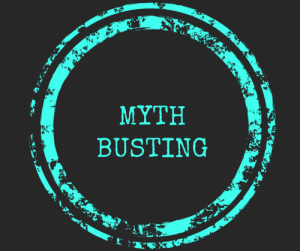 There are three key myths people seem to use to avoid thinking about web accessibility. I think it’s time we busted them. Web Accessibility is often simplified down to “designing for people with disabilities”. For some reason, I have seen this used by people as justification to diminish, rather than heighten, the importance of accessible web design. It allows people to weave a problematic narrative that places accessible web design as ‘a design practice for minorities’ or something that is nice to have or only relevant to government agencies. There are a lot more people living with a disability or that have diverse needs than you think. The Australian Bureau of Statistics (ABS) estimates that 18.3% of the population has some form of a disability (that’s almost one in five Australians). Another ABS Survey from 2012, found that approximately 47% of Australians have a ‘below proficient’ literacy level. These statistics show that we are not talking about small communities here. Instead web access and understanding is a challenge potentially faced by millions of Australians every day. You could be breaching anti-discrimination leglislation and putting your business at risk. In 2014, Sydney woman, Gisele Mesnage, sued Coles over their website experience. Gisele, like many other Australians, had sought convenience through online shopping. However, when she tried to use the Coles website she found the process to be clunky and frustrating. This was because Gisele had lived with a visual impairment from birth. At the time, the Coles website was not designed for users reliant on assistive technologies like screen readers and so Gisele could not use it. Gisele’s legal case referred to Section 5 of the Disability Discrimination Act 1992. This section includes a clause that has been interpreted to mean that organisations need to make sure websites are able to be accessed by everyone. If they can’t be this could result in ‘unfavorable treatment’ of the person who is unable to access the website. Gisele succeed in getting Coles to settle the case and to make its website more inclusive as a result of what is seen to be a landmark case. It it also a case that delivers a very salient lesson to all businesses who ignore the importance of website accessibility. Most users approach a website with a task in mind (to find information, buy something, research a topic) and not as a piece of art – functionality is usually the most important thing. I have some sympathy for this point of view. The international standard that guides accessibility, the Web Content Accessibility Guidelines (WCAG) 2.0, is, ironically, quite inaccessible to most people! This is due both to the dense language used and complex set of rules it contains. This means that accessibility is often thrown into the ‘too hard’ basket. I don’t know about you but this all seems quite sensible to me and actually rules by which we should probably all design by! Yes, there are some specific technical requirements you need to think about to ensure a great user experience for different devices, screen readers and browsers but the basic principles are fairly universal and important. It is true that beyond these guiding principles the WCAG 2.0 guidelines can be tricky to navigate. They provide a whole range of technical approaches, code snippets as well as style and content guidelines. To help you out, and give you a quick checklist to kickstart the process of making your website more accessible, I’ve compiled five things anyone can do in another post. These things are easy and don’t require any technical knowledge. They are designed to support you to make your website deliver a better user experience and help make the web a more welcoming place for everyone. You can check them out, and download the cheat sheet/ poster, here.